Originally published on Heritage Radio Network. It’s fall in New York City. For us, that means the Chelsea boots and knit scarves are out, neighborhood rats have agreed to make themselves scarce, and beverages have gone from cold-brewed, rose-colored, and light, to warming, spirituous, and – dare we say it – pumpkin spiced. Meanwhile, outside the urban sprawl, lucky Northeasterners enjoy changing leaves, long hikes, and apple picking at picturesque orchards. Pastoral heaven. While we can’t all get out of the city to enjoy the bounty of fall in the country, New Yorkers may still win the game of autumn. To combat the fall-in-the-city blues, we get Cider Week. Beginning this Friday, October 21st, and continuing through Sunday, October 30th, New York City bars and restaurants will be taken over by the best in the cider business. Events range from cider releases to family-style feasts to cider and cheese pairings.Here at Heritage Radio Network, we’ve been known to geek out about food and beverage festivals. To celebrate our passions, we’ve asked the intern team what has them fired up for Cider Week and where to tune in to learn more about the fermented beverage taking fall by storm. Move over pumpkin spice…we’ve got cider to drink. I like to think I am up to speed on my beverage game. German Pilsner? Pour me a glass. The terroir of my favorite Malbec? I can tell you a thing or two. But when it comes cider, I’m utterly clueless. At least that was the case until I listened to “The Power of Cider” from Beer Sessions Radio. Boundary-pushing players from the cider world like Herefordshire Dry Cider, Shelton Brothers, Blackduck Cidery, and Angry Orchard, discuss what makes a great cider, the power of regional apple varieties, and the benefits of wild yeast fermentation. It turns out that hard cider goes way beyond apples, with a complexity that can outshine other beverages. With Cider Week around the corner, this is the perfect time to enlighten my palate and try new, bold and bittersweet flavors. I’ve already marked my calendar for Blackduck Cidery Night at Cardiff Giant, which is free and open to the public. This fall, I’ll be promoted from cider novice to aficionado in no time. Wednesday, October 26 at 6pm, Cardiff Giant. FREE. With the falling temperatures, it’s hard not to think about long hikes and cozy weekend trips to Upstate New York. 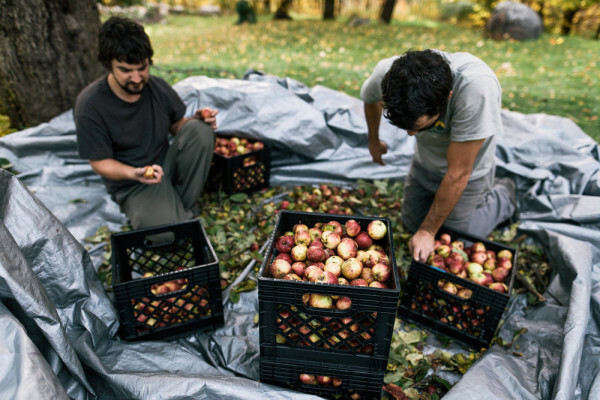 While I sit in my Brooklyn apartment daydreaming about falling leaves and apple-picking, Andy Brennan of Aaron Burr Cidery takes it to the next level: he forages wild apples and cultivates rare and heirloom apple species on his 19th-century homestead. Then, he presses these hard-won ingredients into complex cider brews. Daydreams aside, I’m not leaving town anytime soon, so I was excited to see that Aaron Burr Cidery will bring a taste of the Catskills to Brooklyn this week. I’ll finally get to sample their unique blends at UVA Wines and Spirits this Friday! If you want to learn more about Andy’s process, listen to “Edge of the Wild!“, the second installment of On the Road with Beer Sessions Radio. Friday, October 21 at 6pm, UVA Wines & Spirits. FREE. Cider never meant much to me until I moved to New York and experienced a true northeastern autumn. I guess cider-drinking didn’t resonate with my Southern California upbringing. But something about the crisp air and the pronounced changing of seasons transformed my relationship to the beverage. It’s that sentimental connection to nature that I most enjoy about drinking cider. That’s why I couldn’t resist Jimmy Carbone’s enchanting tour of the Aaron Burr Cidery on “Edge of the Wild!”, the second installment of On the Road with Beer Sessions Radio. I loved hearing owner Andy Brennan talk about drawing inspiration from Wendell Berry’s pastoral texts, Thoreau’s writing on wild apples, and Romantic-era literature. That captured my imagination as I was led through the orchards of Brennan’s early 19th century homestead. 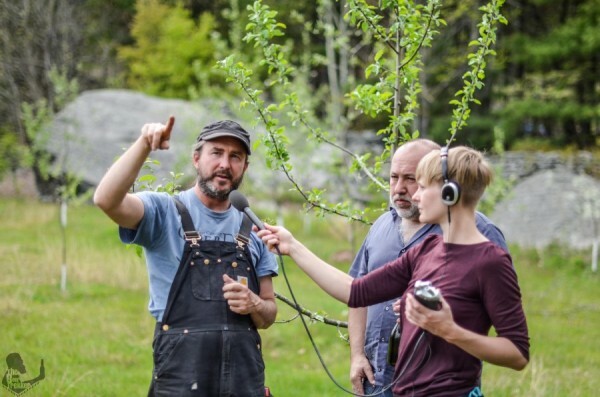 Aaron Burr Cider is going to be at several Cider Week events, but I recommend An Intimate Evening with Aaron Burr Cidery, where Brennan will give a talk about his use of wild, foraged apples as well as knowledge gleaned from centuries-old farmers almanacs. Tasting included, of course. Seating is limited, so get your tickets early! Thursday, October 27 at 7pm, The Wine Lab. $45. My favorite thing about cider is this secret: Behind the revitalized cider industry is a rare story of business and conservation interests merging to spark exciting change! After listening to recent episodes of The Food Seen (293) and The Farm Report (301), I learned that cider makers all over the east coast are rescuing “lost apples.” Since the apple industry has whittled the national taste down to expecting sweet and flawless eating-apples, orchards producing ugly and unpalatable fruit are hard to come by. It turns out that these varieties are key to crafting a delicious and complex hard cider. 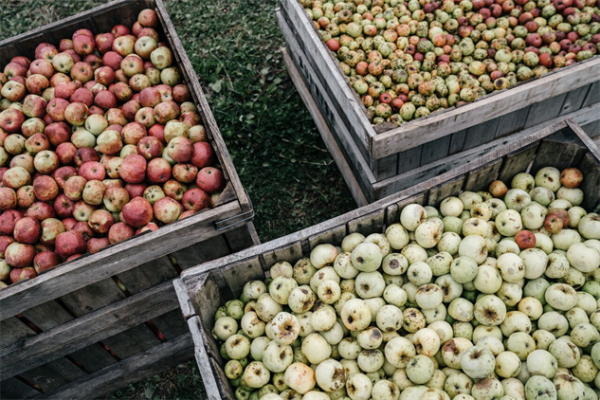 Cider makers are now hunting all over for rare apples – from suburban backyards in New Jersey to the dairy farms of New England. 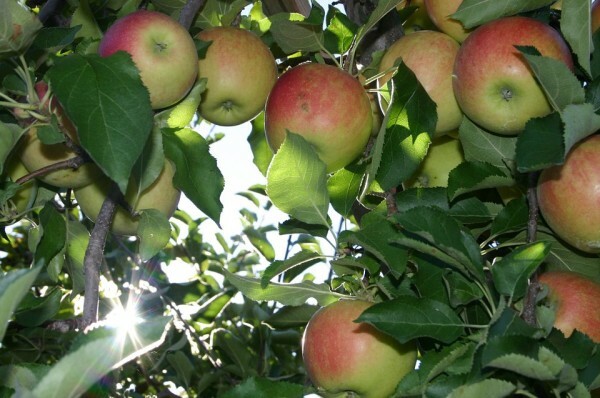 By grafting these trees and propagating new orchards, cider brewers are making a great case for species diversity and conservation! 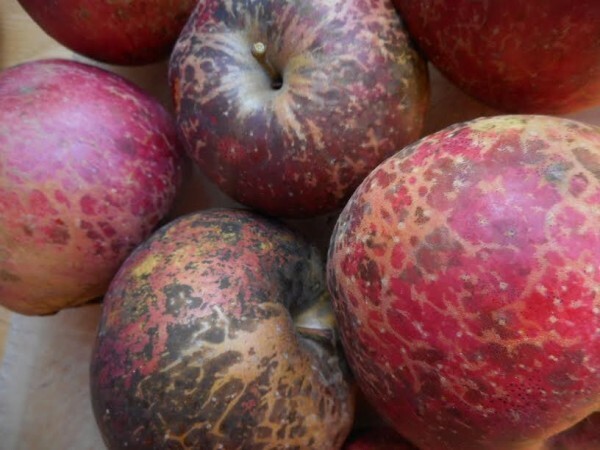 They create a culture where blemished and bitter fruits have value, and teach us that losing these precious varieties of apples means losing an age-old American tradition, and a world of potential for our taste buds. For a long time, I thought cider came in a big green bottle with a Martinelli’s label on the front. It wasn’t until I tried my first hard cider in a small pub in London that I realized the rich historical and cultural relevance cider has outside of the US. So while cider has become a prominent drink in the States, it has long been staple component of dinner tables around the world. In Beer Sessions Radio’s The Culture of Cider, Jimmy Carbone explains that beverage production and cultural traditions go hand in hand. Carbone takes us on a tour of cider producing regions all over the world, from the Catskills in New York to Asturias Spain, and describes what cider represents to each place. I mean, did you know that just by mentioning “sidra” in Spain the locals will most likely point you to Asturias, the country’s most popular cider-producing region? So if you’re like me and aren’t planning a trip to Europe anytime soon, sit back, crack open a can of your favorite cider and join Carbone for an international cider culture crash course. Or better yet head over to Bedford Cheese Shop for Cider Week on October 27th and get a taste of five ciders from around the world—I know I will! “Fermentation with ambient yeast, left on its lees for one year, no Sulphur added. Clean, totally dry and tannic, with great acidity. Notes of honeycomb, white flowers, and pear.” That description sounds like a nice wine, right? I thought so, too, before I realized I was holding a bottle from Eden Specialty Ciders. The appearance of Eden’s “Cinderella’s Slipper”, in a classic 750-mL Burgundy bottle with a simple, sophisticated label, could have fooled me too. Even after I drank it, I might have believed it was a funky natural wine, made from grapes instead of apples. Parallels between cider and wine are hard to ignore. Both are fermented fruit juice, harvested once a year, pressed, and then left alone with yeast and time. Like wine, cider pairs wonderfully with food, ages well, and expresses differently based on vintage and terroir. For wine lovers, pointing out these similarities can be a gateway into the cider world. I’ll have another chance to taste Eden cider on Friday, October 21st as part of Cider Week. 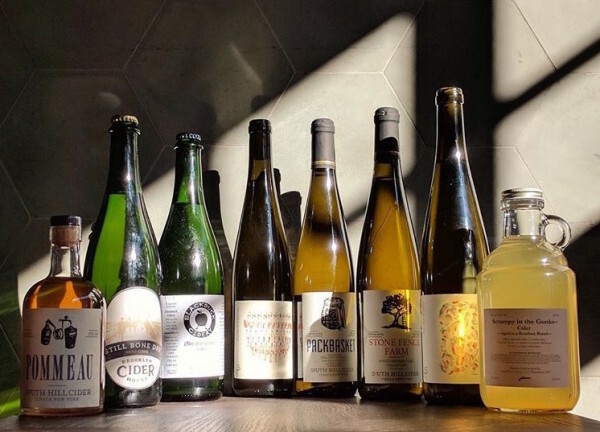 Frankly Wines in Tribeca will host a cider tasting with Eden Specialty Ciders and Farnum Hill Ciders. This event will be a great introduction for people coming to cider from the wine world, and a good opportunity for everyone to notice the similarities between cider and wine—both on the shelf and on the palate! Friday, October 21 at 5pm, Frankly Wines. FREE. Dinavie Salazar is a writer and copy editor, focusing on women’s wellness; and is co-creating a podcast aimed at driving healing conversations around femininity and sexual trauma. She is currently relocating from New York City to Los Angeles.